The Women of Troy have won 10 straight matches and 29 consecutive sets. The tough tournament schedule can be grueling at times, but head coach Mick Haley was pleased with the way his team handled it. 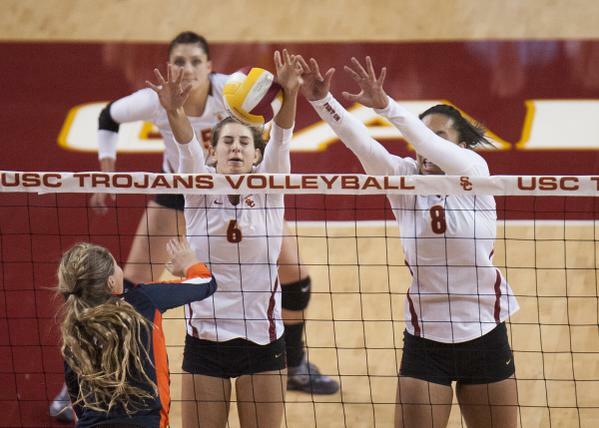 In the first game, against Idaho State, senior Samantha Bricio led the way for USC with 17 kills, to go along with five digs and four blocks. She got plenty of help from freshmen Victoria Garrick and Baylee Johnson who combined for 21 digs. Freshman Alyse Ford also made her mark on the game with six kills and four blocks. Haley was impressed with the newcomers, who have made a huge impact in such a short amount of time. The Idaho State Bengals kept it close during the first two sets, but could not break through. They struggled with stopping the offensive onslaught from the Women of Troy, registering only one team block in all three sets. USC had 13 total team blocks. In the second game, against New Mexico, Bricio finished the game with 21 kills, moving her to 6th on the USC all-time kill list. Ford followed up with 11 kills in the game, contributing 11.5 points. Ford said that as a freshman, there are times where she feels like she's pressured more, but she just tries to handle it. "As a freshman, I just try to do my part and try to contribute as much as I can," Ford said. "I don’t really try to let the pressure get the best of me or anything like that." Haley noted Ford's efforts were really good. "She can get some swings, but if they’re out of system swings, the other team brings two big blockers down on her before we get going," Haley said of Ford. "When we get her in system and get her swinging tonight, she was really good, so that’s really exciting. Almost three kills per set." The Women of Troy have not dropped a set since losing 23-25 in the second set against North Carolina back on August 28. Despite the team’s recent success, Haley isn’t concerned about complacency. Junior libero Taylor Wittingham said that the team is just taking it each match at a time and that they're not thinking about any kind of streak. "We’re just gonna play our game," Wittingham said. "It’s a completely different team from last year, which is so cool to see the dynamics that each person can bring to the court. We have a different sort of energy and confidence about ourselves and if we keep those two things up, I believe that we’re unstoppable and we can do anything we set our minds to." The Women of Troy play in the Oklahoma Nike Invitational against Oklahoma and Maryland before Pac-12 play starts for them on Sept. 23, when they will face rivals UCLA. Follow Jen Ramos and Dan Lovie on Twitter at @jenmacramos and @LoviSports.